Well, wasn’t this all quick and easy! Last week I wrote this piece asking Australians to please have a closer look at what has been going on recently (with regard to the frighteningly powerful alliance between the nation’s politicians and the corporate media, and the alleged recent threats of homegrown Islamic terrorism), and to please not allow your freedom to be relinquished at the hands of a self serving, fear-based propaganda machine. I feared it was already far too late… but wow, the speed at which these guys can operate, when they feel like it, is phenomenal! Does anyone remember Omarjan Azari? No matter, he doesn’t seem to be of any importance anymore. 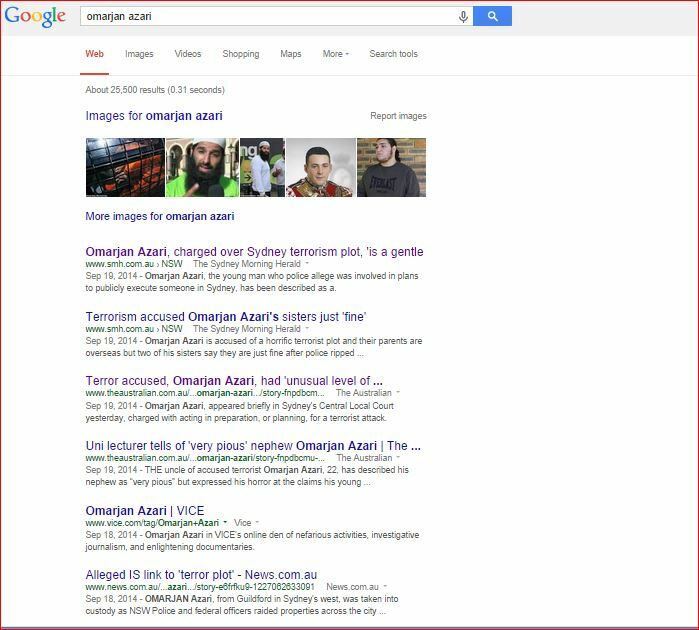 Mr Azari, 22, was the central figure in Australia’s largest ever anti-terrorism raids. For some reason it took 800 heavily armed officers to detain him, and 14 other people (13 of whom were almost immediately released without charge). The raid took place, we’ve been told, because of a phone call between Azari, and another man who has been under surveillance for some time. On September 18, the world read, horrified, about the alleged plan of Azari to capture a random Australian on a public street, drape an ISIS flag over the person, decapitate the person in public, and release the footage of the murder via social networks. Of course, beheading was never specifically mentioned as part of this alleged plot (it was just an “assumption” made by intelligence operatives), but that’s a minor technicality. 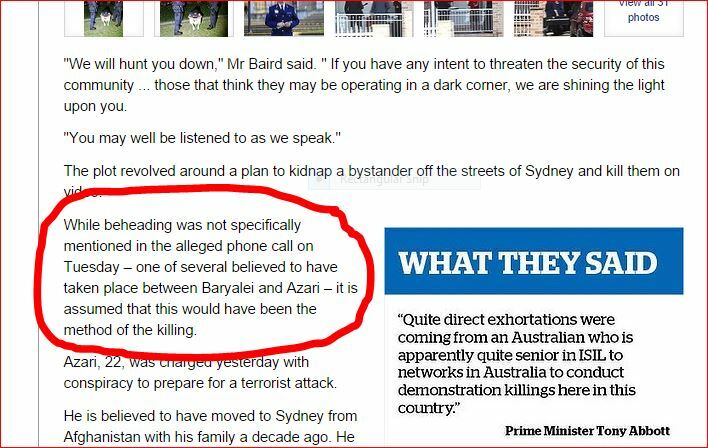 After only two days of media saturation, media focus had drifted away from the specifics of the Azari arrest and onto the more pressing matter of how the Federal Government would protect Australians from the ever increasing threat of ISIS terror on our own soil. In fact, a quick Google search for ‘Omarjan Azari’ today (October 1), shows that pretty much all mainstream media have been aggressively disinterested in making any mention of him at all since September 20. Azari has been taken out of the game. He has already served his purpose, it would appear. 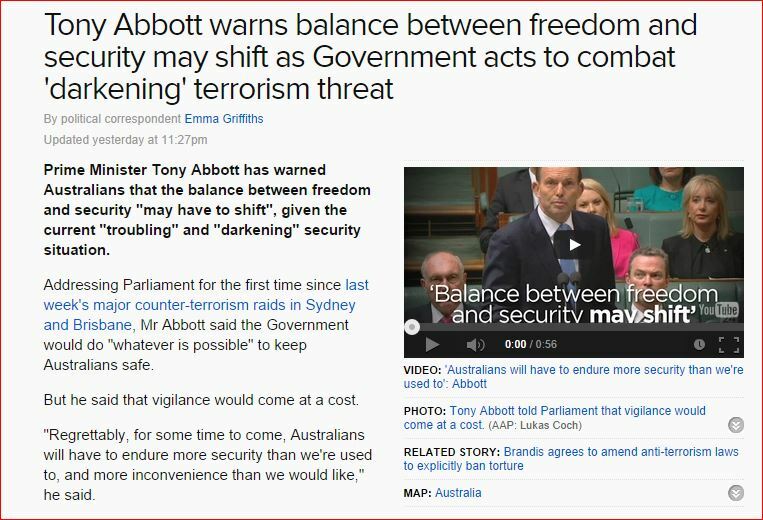 It didn’t take long at all for Prime Minister Tony Abbot to swoop in and vow to protect the Australian people from all this sudden (alleged) Islamic terrorism. Of course, it would have to come at a price. And there you have it. 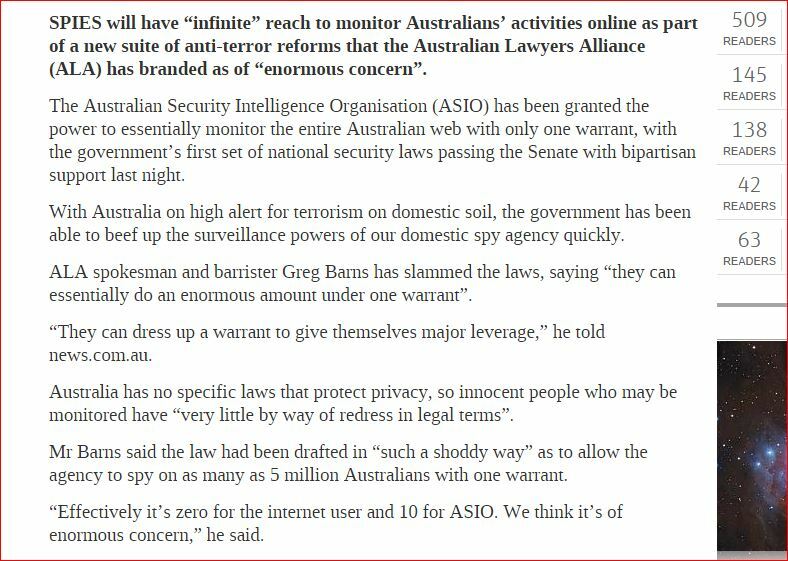 With the willing support of a frightened nation, the Australian Security Intelligence Organisation (ASIO – the Australian spy agency) now has almost unlimited powers to spy on any Australian at any time, without cause or justification.